Diagnosing asthma is often tricky because many children have wheezing episodes before age 3. "She started wheezing and had a barking cough that wouldn't quit," says her mom, Iliana Mavinkurve, who lives in Livingston, New Jersey. "I had asthma as a child, so I recognized Sonali's symptoms and was worried." At first, doctors called Sonali's condition "reactive airway disease," because children her age can't do the breathing tests necessary to pinpoint asthma definitively. "But when her symptoms kept coming back, given my family history, Sonali got the diagnosis," says Mavinkurve. Given how dramatic asthma symptoms are, you'd think it'd be a snap to diagnose. That's often not the case, especially in kids under 5. "As many as half of children have at least one episode of wheezing before age three, but after that most never wheeze again," says Dr. Paul Williams, clinical professor of pediatrics at the University of Washington. In fact, only 15 to 20 percent of kids who wheeze go on to have lifelong asthma. Plus, very young children can't adequately perform spirometry, which requires patients to blow as hard and as long as they can into a meter; it's usually not till they're 5 or 6 that kids can do the test, which can accurately diagnose asthma, says Williams. In the meantime, you can get a pretty good sense of your child's risk by using the Asthma Predictive Index, which we've adapted into the "Risk Checker" at right. So grab a pen and see how your sweetie's symptoms stack up. 1. Has your child had frequent wheezing before age 3 (four or more episodes in one year that lasted longer than a day and disrupted sleep)? 2. Does she have at least one of these major risk factors? 3. Does she have at least two of these minor risk factors? If you answered yes to the first question along with at least one other, there's about a 76 percent chance your child's symptoms will persist through grade school. Meanwhile, 95 percent of kids who have only one yes (or none) will likely not develop asthma after age 6. Great news! 1. 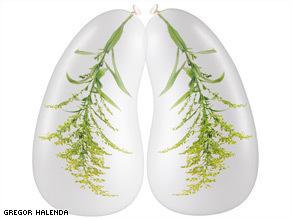 An irritant, allergen, or virus makes its way to the lungs from the upper respiratory tract. 2. The immune system kicks into gear, producing antibodies and other substances to fight it off. 3. These immune chemicals trigger two big, simultaneous changes: The lungs' airways begin to constrict, causing spasms, and they also become inflamed, which leads to further swelling and mucus production. Despite the fact that asthma has the potential to be so well managed that it becomes practically a nonissue, it's still grossly undertreated, says Dr. Bradley Chipps, pediatric pulmonologist and allergist at Capital Allergy and Respiratory Disease Center in Sacramento, California. "Number one, physicians often view asthma as an episodic disease," says Chipps. "They just do crisis intervention and aren't seeing patients back on a regular basis." The secrets to getting asthma under control: First, ask your doctor for a written asthma action plan. Consider it your customized road map to your child's medication as well as to all the lifestyle strategies that will help you help him avoid his triggers. The second step is to find the best mix of medicines for your child -- and then use them as directed.Parenting.com: Are we overmedicating our kids? Why: Inhaled corticosteroids reduce airway inflammation long-term. About two thirds of children in this category will have good control using one every day. Same goes for kids who flare only during certain times of the year; the drug protects them through their danger zone and then they can stop. Why: If corticosteroids alone aren't working, an anti-leukotriene can block the chemicals that are further fueling airway swelling and spasms. Those who are still suffering may need to add an LABA, such as Serevent or Foradil, which are longer-lasting bronchodilators. What to watch for: Upset stomach, cough, dizziness, drowsiness, ear pain or infection, swelling of the mouth or throat. The FDA is also investigating a possible association between the use of anti-leukotriene medications and behavior/mood changes. Laura Flynn McCarthy is a mom of two boys. She lives in New Hampshire.